If you are looking for an affordable way to enhance the look of your landscapes then perhaps you may want to install a pergolas or an arbor? This is a cost effective way of bringing some style and elegance into your property. 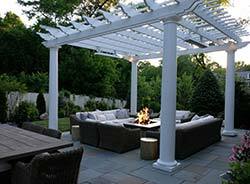 At Krefta Landscape we can design and install pergolas and arbors for residential and commercial properties in the Eastern Massachusetts region. We are a full service landscape and hardscape company with extensive experience in transforming the way people use their outdoor space. We believe that no matter how small or large your landscapes are; we can add a feature that will add significant aesthetic appeal. Our company has been changing the way property owners use their landscape setting by adding function and visual appeal. 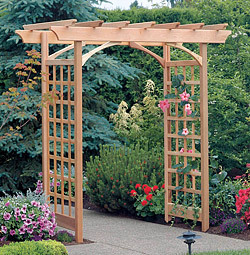 Arbors can be used as a support for vines and climbing plants; which can enhance their appeal. Can serve as an entry to your garden or pathway. Simply used as a focal point. Arbors are often used for weddings. 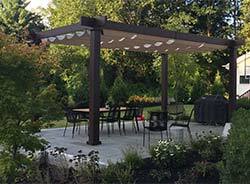 Pergolas can become a great outdoor living area. Let the team at Krefta Landscape add that something special to your outdoor spaces and all within a reasonable budget. The great thing about arbors and pergolas is that they are easy to install and require minimal amounts of materials. This enables us to create a special place in your landscape setting without all the heavy construction work. At Krefta Landscape we understand that every client is an individual with their own tastes and sense of style. For that reason we provide custom design and installation services so that everyone gets exactly what they want. We will guide you from planning and design, all the way to the end. It is our goal to ensure you are completely satisfies with our installations. We use only the best and highest quality materials for the construction of our arbors and pergolas. Traditionally they are both normally built using timber products. However other products like vinyl are also becoming popular. Let one of the professional from Krefta Landscape provide you with a free consultation on your next pergola or arbor project. We will transform the look and feel of your landscapes. You will be delighted with the results!